Hello! I'm Devansh Desai and I am a 4th year undergraduate computer science student at the University of Pittsburgh in Pittsburgh, PA. I'm also a passionate, driven software engineer who enjoys working in all areas of the field and solving challenging, complex problems. This is my education and work experience timeline. All of my past work is explained here. You can download my résume in PDF format if you would like. Click below to either view my GitHub profile or my LinkedIn profile. Helped students and professors in software related issues with their computers. I currently attend the University of Pittsburgh in Pittsburgh, PA. I study computer science and intern as a software engineer during my summers. I hold a 3.74/4.00 GPA and a 3.88/4.00 CS GPA. I have also made the Dean's List in all of my semseters at the university. I attended Parkland High School in Allentown, PA where I graduated with a 4.56/5.00 GPA and was part of the top 3% of my class. These are some of the projects I have worked on in the past. ReddiTray is a desktop tray application that notifies you when you have unread Reddit messages and allows you to read your messages and mark them as read. It is a complete, stand-alone solution for Reddit messages without the need of the traditional web browser. ReddiTray is built on GitHub Electron and Node.js. It also uses Vue.js, the Reddit API, Snoocore, and Marked.js. Click the below button to view screenshots of ReddiTray. Dhirana is a University of Pittsburgh non-profit organization that raises funds for the Birmingham Free Clinic. It brings in $10,000+ each year through hosting a national Indian classical dance competition where 8 teams from all over the United States compete for 1st place. I served as the Design Chair for the organization for two year and I made the website, logos, numerous flyers, and over 10+ promotional videos for Dhirana 2015 and 2016. Phone Snake is a game I created to explore the HTML canvas. I wanted to do something like snake but with a twist. The objective is to successfully enter your phone number. There are three difficulties: easy, medium, and hard. Even I haven't beat the game on hard, click the link below and see if you can! I worked on a Kobuki Robot in a project-only robotics class during the fall of my 2nd year. I worked on 5 complex, in-depth projects over the course of the semester. Click below to read more about the specific projects. In my Programming System Design on a Mobile Robot Platform class during the fall of my second year, I worked in a team of two on various interesting projects with the Kobuki robot. The class was composed of only projects so for the whole semester, my partner and I worked extensively in Python to make the robot do cool things. Project 1 was called Sennott Square Rover. My partner and I were required to be able to SSH to the robot a single command or a series of commands for movement (ie. Forward 2 meters, Right 90°, ...). We had to account for wheel slippage by creating an algorithm that would gradually accelerate the robot for any distance input. In Project 2, Soccer Kick, the task was to use the webcam of the laptop mounted on the robot to follow a colored line on the ground and to make sure that during a sharp turn, the robot would not go off of the line. Then, the robot had to scan the environment through the webcam for a red ball and then an orange goal. Using only three linear movements, the robot had to kick the ball into the goal. This project required figuring complex similar triangles to cover all cases of the ball and the goal's location. The ball and goal could be placed anywhere in relation to robot and in order to successfuly execute the kick, our algorithm had to be robust enough to cover all edge cases. Project 3 was called Selfie Bot and it incorporated a Microsoft Kinect. The robot was to follow a person around the building automatically using only colored construction paper on cardboard. Using the Kinect, the robot recognized the color pattern on the cardboard and also the distance to the person to decide whether to move forward, backward, or turn and how fast. On the other side of the cardboard, there was another pattern. If the robot saw this pattern, it would start a countdown and at 0, it would take a selfie of the user. 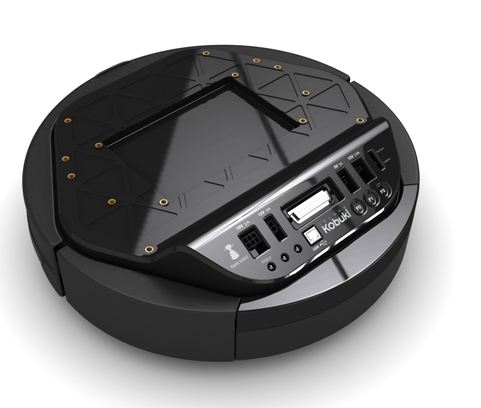 Project 4 was called DJ Roomba and the idea for it was mine, inspired by the TV show Parks and Recreation. Essentially, the robot was to move randomly throughout the building and play music. For the class, this was too simple so I decided to incorporate voice recognition. Using the Google Speech Recognition API and the Spotify Web API, my partner and I recreated DJ Roomba with a modern twist. We could say "Mr. Data" (the robots name) and "play artist ..." and the robot would stop, recognize the command, play a random song from the top 20 results of the artist on Spotify, and then continue moving about. Another command was playing a specific song by an artist. Two Windsor Plaza is an office building in Allentown, PA. I created this website using the Bootstrap framework for the business in order to promote and augment their brand while increasing visibility. I made this website for Allenwood Motel, a client in Allentown, PA. This was my first client as a freelance web developer. I used the Bootstrap framework to make the website fully-reponsive and mobile-ready. I'd love to hear from you! Feel free to connect with me on any of these social networks.